The Adirondack Mountains offer a variety of ice fishing opportunities for the amateur as well as the veteran. It is quite a sight indeed, when villages of ice shanties start to pop up all over the Adirondacks. Northern Pike, Walleye, Yellow Perch, and Lake Trout, are just some of the delicacies pulled from our many lakes. If you are not familiar with ice fishing, check out the rule book when you purchase your license, or check with any local tackle shop. There is plenty of information out there as to the proper equipment, bait, and methods. The simplest ice-fishing is probably for yellow perch. The method is called "jigging", and the perch are as prevalent during the winter as they are during the summer. Perch are usually caught near the bottom, so choose a properly weighted sinker. You will need: an ice chisel, or something similar to cut a hole in the ice, a skimmer or strainer to keep the hole clear, hand line, small hooks, sinkers and some bait. The most common and effective bait is a perch eye, or a strip of belly skin. These should be jigged up and down just off the bottom. Don't we all love the "perfect" day for fishing? Unfortunately, those days are few and far between, especially for ice fishing enthusiasts. The nature of the beast, is cold, snow, and most often wind. As with fair summer fishing, some times the worst weather is the best fishing. To make sure this doesn't become a problem, proper outer wear, and preparation are the keys to a successful day. Check with us again soon for all of the hot spots to ice fish! 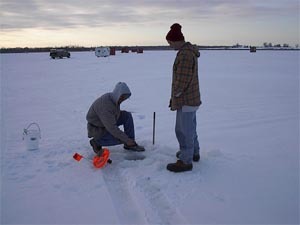 The first thing that you need for ice fishing is ice - A whole lake's worth and something to cut a hole in it. Persons under 16 years of age. When fishing waters of the Marine District or in the Hudson River south of the Troy Barrier Dam. Note: A fishing license is required on the entire length of all Hudson River tributaries south of the Troy Dam to the Tappan Zee Bridge even if the tributary is subject to tidal flow. When fishing on licensed fishing preserves. Citizen-resident owners, lessees and citizen members of their immediate families occupying and cultivating farm lands, when fishing on their own lands. Active members of the United States Armed Forces who are New York State residents and are in the State for a maximum of 30 days. When fishing, such persons must carry their service identification cards and furlough papers. Persons holding farm fish pond licenses and members of their immediate families, when fishing on waters covered by their licenses. Resident parties at United States Veterans Administration hospitals, Department of Mental Hygiene institutions, and Department of Health rehabilitation hospitals, and inmates at Division of Youth rehabilitation centers. A free permit is available from: NYSDEC License Sales, 625 Broadway, Albany, New York 12233-4790. Persons holding a fishing license or combination hunting and fishing license (including those entitled to fish without a license) may take fish by angling, spears, longbow, nets, or traps where permitted by law or DEC. Almost all the lakes and small ponds throughout the state are good potential ice fishing spots. The larger ponds where depths average 10' - 15' are prime spots for pickerel, yellow perch, sunfish and northern pike. For those who which to fish for northern pike, walleye and lake trout, lakes where depths exceed 20' - 30' or more, need to be scrutinized more closely. Learning this type of water can produce world class fish. Where permitted, landlocked salmon, rainbow trout and brown trout that in the hot summer months generally stay deep where the water temperature is cooler, can generally be caught just a few feet below the ice in winter time. Fran Betters has been known by sportsmen for years as the definitive expert on fishing and fly-fishing in the Adirondacks and author of many indispensable books! He offers fly fishing and casting instructions, stream orientations and an open invitation to all who fish to attend his FREE Barbeques and flycasting clinics throughout the summer! Offering Outdoor Guided Adventures and Skills Instruction; Wilderness Canoe Trips, Canoe & Kayak Instruction, Family Fishing Trips, and so much more. (518)-523-4555 /Blue Mountain Lake Location Open 7 days from 9 AM until 6 PM. Blue Mountain Lake,144 Main Street, (518) 352-7306 Both locations feature many crafts from hand pounded handmade black ash pack baskets, cloth, metals, jewelry, to balsam and clay. Blue Mountain Outfitters is a full service fly fishing outfitter offering proven names Fly fishing instructions and guiding are available upon request. Instructions ,Programs, Outfitting Services, Canoe & Kayak Rentals, Camping Gear Rentals, Transportation. All of your outfitting needs in the Adirondacks. Tahawus Guide Services offers traditional outdoor adventures for people of all ages, regardless of ability level or physical condition. Based on the legendary guide services of the late 1800's, the guides of Tahawus are experienced outdoor professionals who will delight you with the natural history and lore of the Adirondacks. Offering Fly Fishing, Canoe and Fishing trips, Mountaineering, Ski Tours, and so much more.